There are plenty of roadtrip styles, some travellers prefer to take it slow and stop as often as they can, while others move quickly between towns and cities to take in as many sights as possible. Some backpackers prefer to take the road less travelled, while others prefer to hit up the backpacker hotspots. But there’s one thing most backpackers and travellers have in common, and that’s the goal of keeping the trip affordable and a set budget they are trying to stick to. 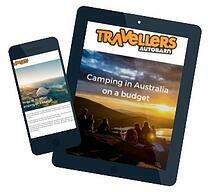 If you want to know everything about road trippin’ around Australia on a budget, then download our Guide!